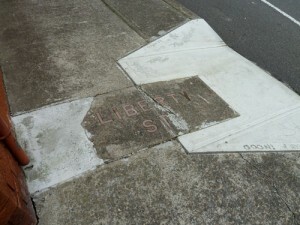 In some of Sydney’s older municipalities the names of streets and parks were once set into the concrete footpaths. Reminders of a time when people got about on foot more regularly than they do now, some of these still exist around the suburbs. 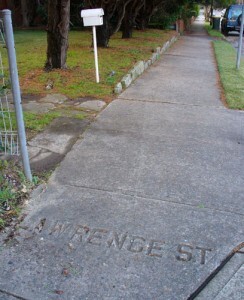 On this footpath in Chatswood, for example, the name ‘Lawrence Street’ appears to have been pressed into the concrete while it was wet. Other examples are more elaborate. In parts of the former Municipality of Petersham (that is, Petersham, Lewisham and Stanmore) the name is embedded in the paving slab in contrasting red concrete. 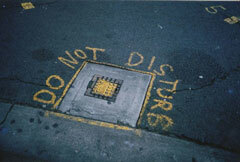 When one of these slabs gets broken you can sometimes see the wire formwork that holds the lettering in place. Although many have been broken or mutilated over the years, local councils have begun to recognise the heritage value of these concrete names. 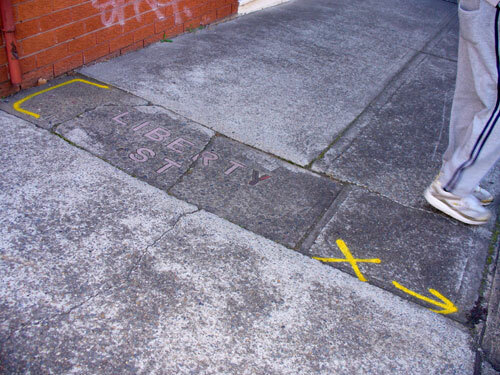 The Marrickville Heritage Study of 1984-86, for example, lists street names on footpaths and kerbing as interesting examples of the type of works undertaken in the old Municipality of Petersham, adding that the remaining examples help to define the character of the area. Despite the recent interest in preserving them, I have had some difficulty in obtaining specific information about how and when these pavement embellishments were originally made. However I did find from the Haberfield Conservation Study, prepared for Ashfield Council in 1988, that ‘blue and white enamel street name signs and red cement lettering of street name signs let into the footpath were … distinctive features’ of the model suburb of Haberfield developed by entrepreneur Richard Stanton between the years 1901 and 1922. It seems likely that the Petersham street names came somewhat later. Now incorporated into the Marrickville local government area, the Municipality of Petersham was established in 1871. In 1929 its Council took out large loans to commence a program of paving its roads with concrete and replacing its asphalt footpaths with concrete at the same time. These types of works became a major part of a program to provide employment for men during the Great Depression of 1930-1937. By 1948 Allan M. Shepherd’s book The Story of Petersham was able to boast that “today only a very small proportion of the total length of all the footpath paving of the Municipality is not of concrete” and that “there are no unmade roads, lanes or footpaths, and every thoroughfare is in good condition”. Shepherd’s book does not mention the concrete street names specifically, but it is safe to assume that the making of these was included in that great concreting project of the 1930s. For several years I have been monitoring a badly cracked ‘Liberty Street’ name in the footpath on the corner of Cavendish Street, Stanmore. In May 2010 I thought its days were numbered when I saw sprayed marks on the footpath indicating that Marrickville Council was going to construct a pram ramp on the kerb. However some months later I found that the rectangle of old concrete bearing the name had been saved, although it was surrounded by incongruously white modern concrete and a straight cut had been made in it so that it could conform to the slope of the ramp.